Spring has arrived at the Temple and while the updates might be of minor interest to you they are big milestones for me. I am trying to return towards my original approach towards SL creativity, my brand and my vision while balancing the financial and management aspect of it being my job too. So what do I want to achieve in the future? - I plan to update the current products so they all offer the same options and are up to date to my current range of possible application to reduce confusion, while taking more time to work on the -Worldmaker- projects which are focused on region building themed builds. - I am planning to say goodbye to two of my current 5 regions, Aear and Annon, not only for tier-sake but also so I can feel less overwhelmed by rebuilding and updating what I am currently owning. Having to pay fewer tiers monthly allows me to feel less compelled to participate in so many events that drain a lot of time I wish to employ otherwise with a different purpose. - Update and rebuild fully Selidor and Athan, maybe open twice a year my private region for curious visitors and photographers. I have already started on updating the interior of the Temple mostly because at a certain point I realized my skin fair booth had better texturing that my own main store... And I started to cover all of the Libertine products also on Marketplace, once realizing my gacha reseller alt has a better Marketplace store than my main brands of which I do make a living out of. You would think those are some basic things that a SL store owner of 11+ years is aware of but the length of my SL presence is its own curse. Maintaining and updating my creations often gets everything to a haul: having to retire, remake and update my creations makes me stop and wait until everything is on the same level so I can step further to load on MP or feel as I accomplished something. This wait made me skip years of potential exposure because of not focusing on store and product updates but immediate deadlines with a lot of events that do help me be more successful financially on the short term but on long term destroy any chance for more free creative ideas and projects. The choice to give up temporarily most of events is not an easy one as the financial hit is consistent but I trust that in the future it will gain me more time, better products and better sales, aiming at more longlasting and worthwhile products. I also wish to add this is not a stance against events at all. 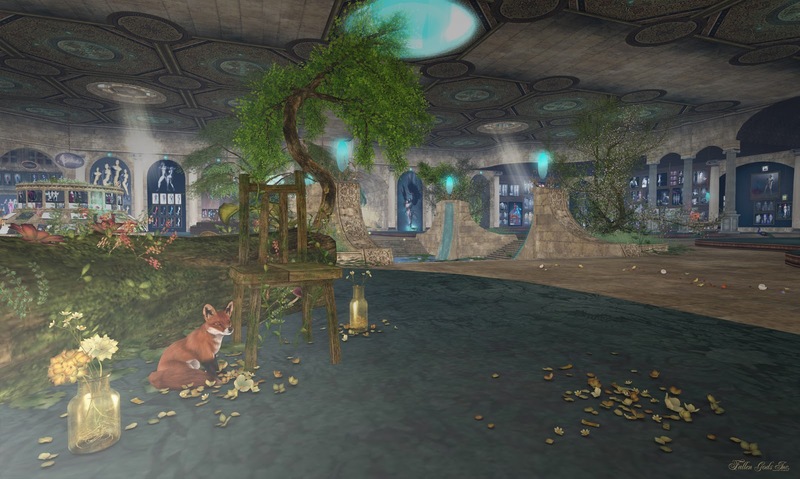 I do believe Events in SL are fresh new blood of ideas, themes and fun, organized by incredible folks that do kick their butts for monthly great chances and fun occasions for all: creators, bloggers and customers. This is my personal choice out of personal goals and perception and the point I Am in my SL career, Life and what I want to achieve. I will still maintain a couple of events a month though, so you don't think I am dead-er than usual. 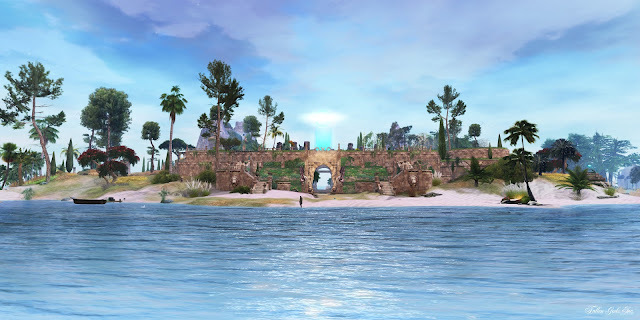 So come to the temple to admire the new rug textures, gacha circle, stone floors and updated center pool and take time to take a trip to Aear and Annon as they might not be around for much longer. 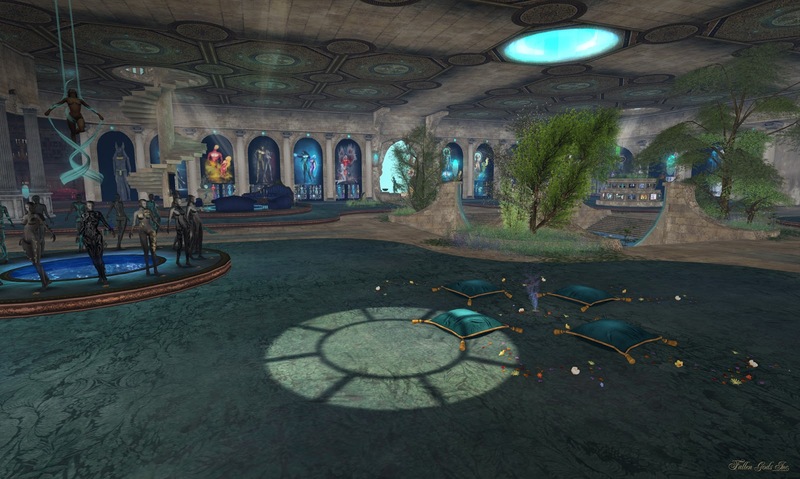 Did you notice the Libertine showroom is now a full world with a Mansion in the Sky? Best mind soul and heart wishes always and thank you for all you continue to do !